Gap Comedy brought us another excellent night of comedy by a top comedian. 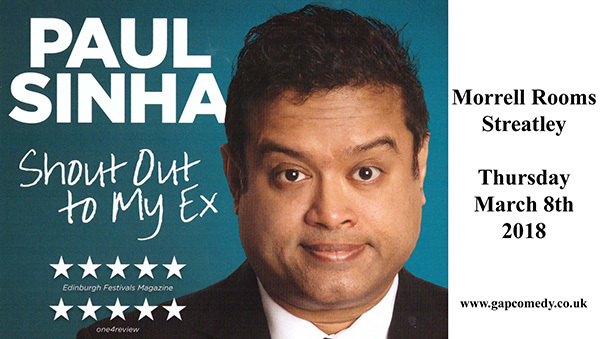 This time we were treated to Paul Sinha talking gently about his life. It was a real treat to hear a gay man just talk about his life. He wasn’t trying to shock or titillate and if anything he revealed himself as a bit of a nerd. Case in point he seems most proud of his quiz team, the Gray Monks, being current champions of the Quiz League of London. Paul Sinha is best known as Sinnerman, one of the chasers on The Chase, which is probably where many of us first heard of him. Fans got glimpses of life behind the scenes of The Chase with little humorous vignettes of his fellow chasers. For an Asian man who’s a qualified MD, he’s certainly shown courage not to quietly go along with family expectations, but instead pay his dues leaving medicine and making next to nothing on the comedy circuit. His show, called “Shout Out to My Ex” gave us some funny concepts coming from that relationship break up. He’s decided his superpower is turning people straight and suggested his best market would be selling his services to the evangelical community. And my favourite throwaway was that the best dating app out there for middle-aged Asian men was Uber. The audience clearly warmed to him and engaged in banter throughout the show including when he got himself caught in the middle of Goring v. Streatley civic pride when he misidentified which village George Michael had lived in. He managed to turn a slightly awkward moment into a running gag throughout the rest of the show. The show ended with a lively Q&A session. An unusual way to end a comedy show, but very effective in the hands of Mr. Sinha. We look forward to Gap Comedy’s next offering.